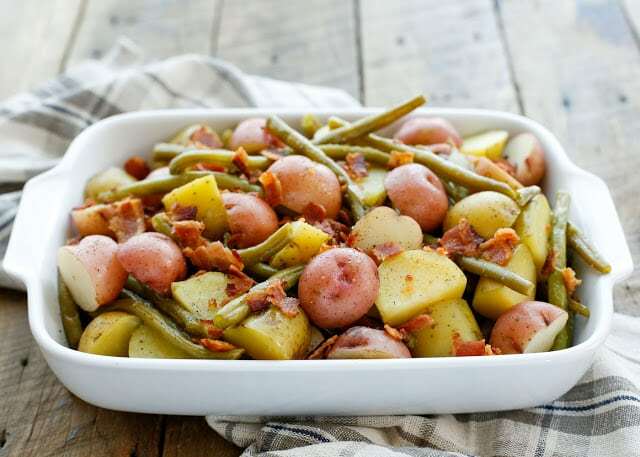 Tender green beans, baby potatoes, smoky bacon, and sweet onions are perfectly combined in this irresistibly classic southern side dish. 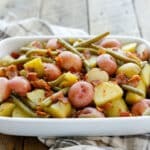 I served these Southern Green Beans and Potatoes along with our favorite Crispy Oven Baked Chicken. It was the perfect pairing, because the chicken finished cooking just as the potatoes were tender. The meal was a hit with my whole family. When my friend Melissa (of Melissa’s Southern Style Kitchen) told me she was writing a cookbook last year, I told her I wanted to be first on her list to review it. I received my advance copy a couple weeks ago and I’ve been flipping through it and drooling over everything since it arrived. 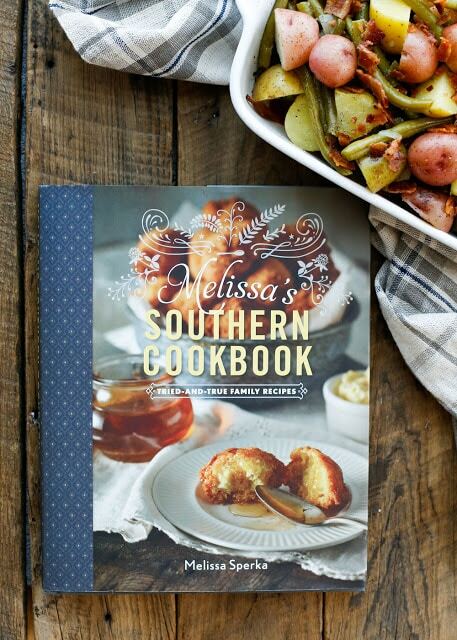 The cookbook, Melissa’s Southern Kitchen, is being released TODAY and you can find it here on Amazon or countless other retailers. I am so excited for her and I know that everyone is going to love it as much as I do. Whether you are looking for a full Sunday dinner or a casual weeknight supper, there is a recipe here for every occasion. With recipes like Melissa’s unforgettable Buttermilk Fried Chicken, BLT Macaroni Salad, Pecan Praline Baked Brie, and so many others, I’m going to have a lot of fun trying these recipes! Kitchen Tip: I use this knife and this 9×13 baking dish to make this recipe. Add the green beans, chicken stock, 1 teaspoon granulated garlic, and 1/2 teaspoon kosher salt. Stir and cover. Reduce the heat to medium-low and simmer for 30 minutes. After 30 minutes, sprinkle the green beans with 1/2 teaspoon granulated garlic. Arrange the potatoes over the green beans. Dot with butter and sprinkle with the remaining salt and pepper. Cover and simmer for 25-30 minutes, until the potatoes are fork tender. Stir gently and transfer to a serving dish. 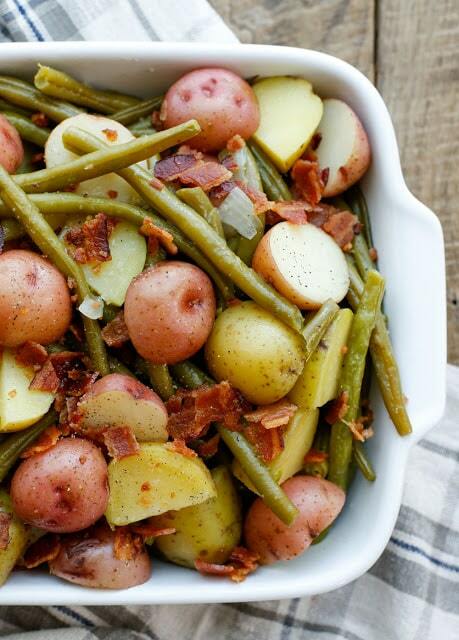 Crumble the bacon and sprinkle it over the green beans and potatoes. Enjoy! I used a combination of baby red and Dutch yellow potatoes. Any potato will work for this recipe, just make sure the pieces are roughly the same size so that they will finish cooking at the same time. Looks delicious. Potatoes cooked with beans was a regular item on Mom's menu. Could I add the potatoes and beans at the same time? My husband likes the beans more crispy, not mushy.